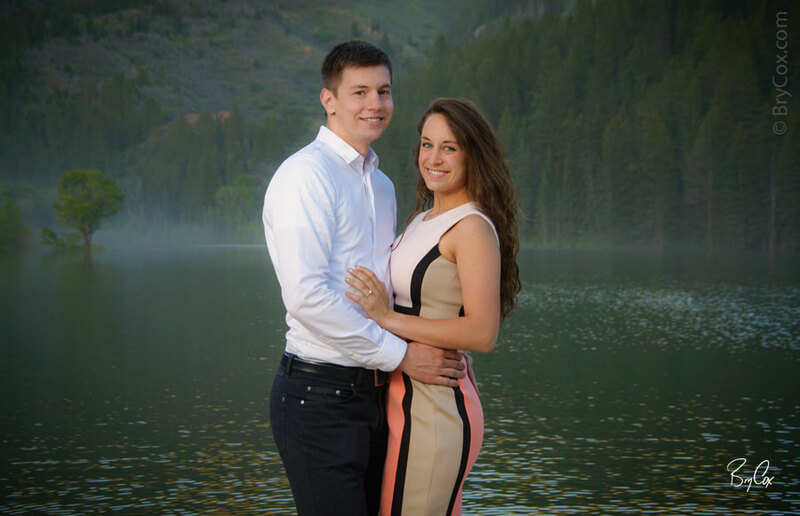 Carly and her fiancé are somewhat new to Utah, and love the beautiful mountain ranges that are so close to civilization. 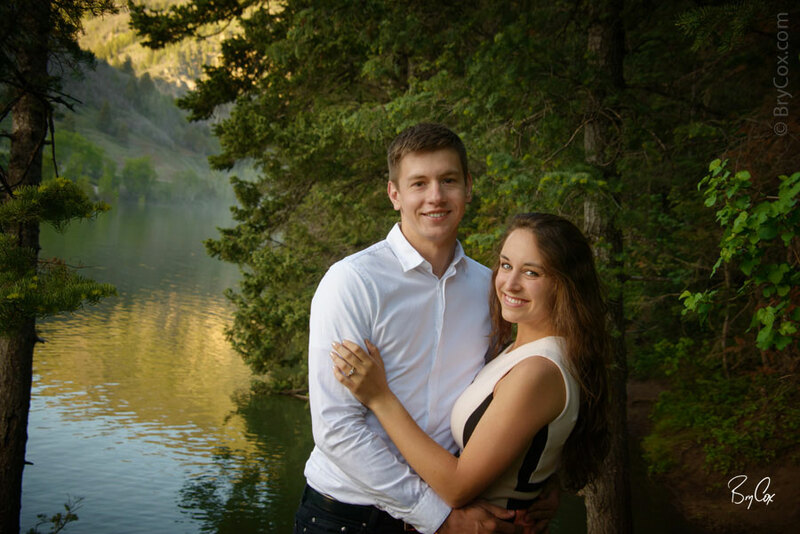 For her engagements, she wanted a canyon with a view, so we shot at Tibble Fork. I love this area because you can see the back side of Mount Timpanogas in the background which has an elevation near 12,000 feet. The air is so clear and fresh in these canyons, and we started our shoot as the sun was setting. 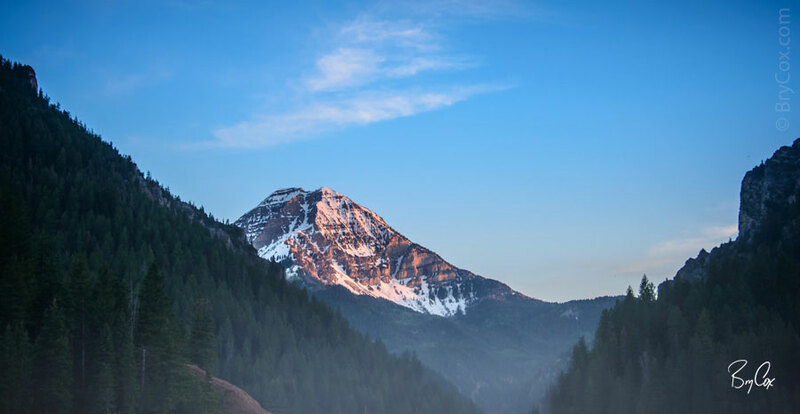 For the first set of photographs, I used Mount Timp as our backdrop, framed by the diagonals of American Fork Canyon. I created a trio design based on these first set of images because they looked so great together as a set. 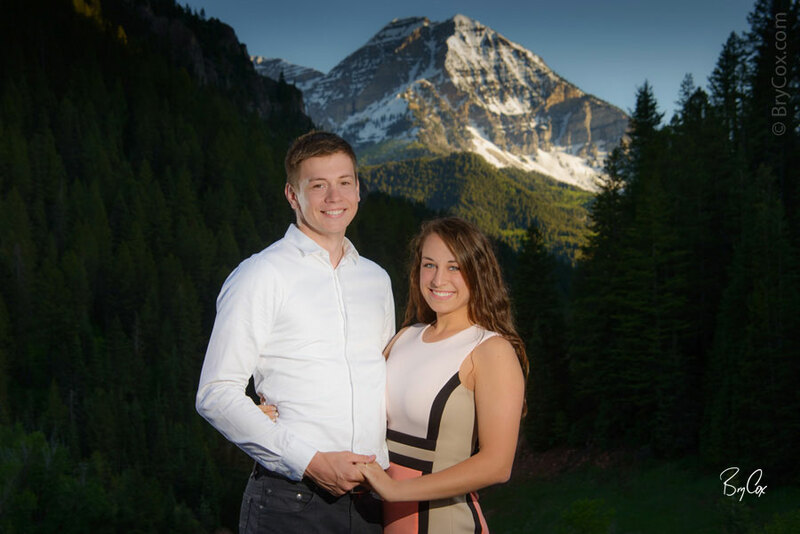 And with some easy, short walks we were able to get a variety of mountainous backgrounds for Carly. 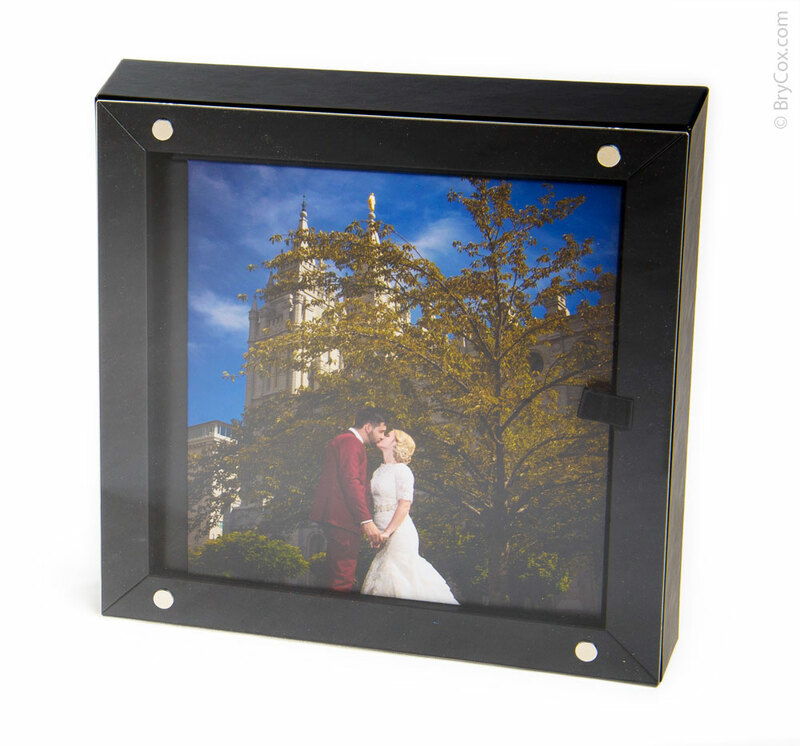 Here we used the trees to frame them, creating a vivid green background. Or showing the water as the sun was setting, framed in by vertical tree trunks. And as the sun set, the cool canyon air mixed with the water and turned a gorgeous misty blue in the distance. That lone tree in the background made for a great balance point for this set of romantic images. And notice that no matter the time of day or angle to the sun, this couple always looks gorgeous and their backgrounds look gorgeous. Utilizing master lighting techniques means that they have great skin tones, eyes that pop, and the background is vivid and real. 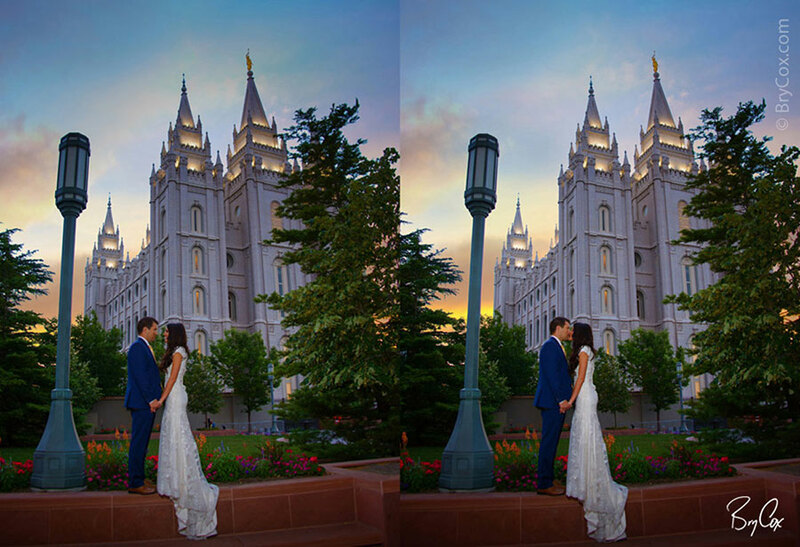 Sadly, other photographers may use great locations too, but because they use “natural light” (which is haphazard), their photos turn out with blotchy skin, dark eyes, and their backgrounds and faces are often washed out (a modern trick to save poorly shot images). This is sad because photography is the one thing we keep from our wedding for our entire lives. Hopefully you can see the difference. I work to create true heirloom quality photographs that your kids will fight over once we’re all dead. And the secret starts with great lighting, mixed with great chemistry and body language, to create a shoot with tons of wonderful images to choose from. 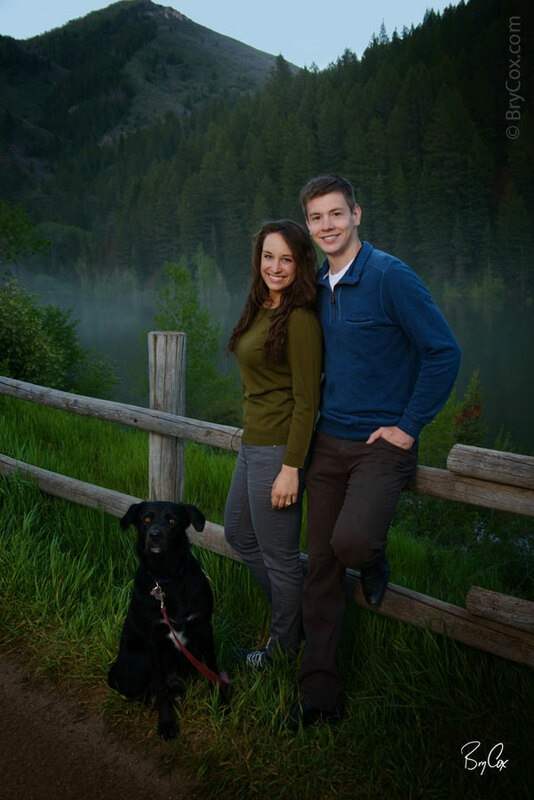 Before we left, we did a casual clothes change to get more images with their cute dog. This was one of my favorites. They look great, the dog is perked up and happy, the lines and colors of the background are awesome, and the mist is peaking through the trees creating even more dimension so that it feels like you’re there in the canyon. Finally, I took some of my favorites to create this 9-up collage. I love the variety and personality in this design. And of course at sunset I couldn’t help but shoot one photo of Mount Timpanogas off in the distance, lit by the setting sun. I love the mix of warm and cool colors in this. If you’re getting married, give me a call. 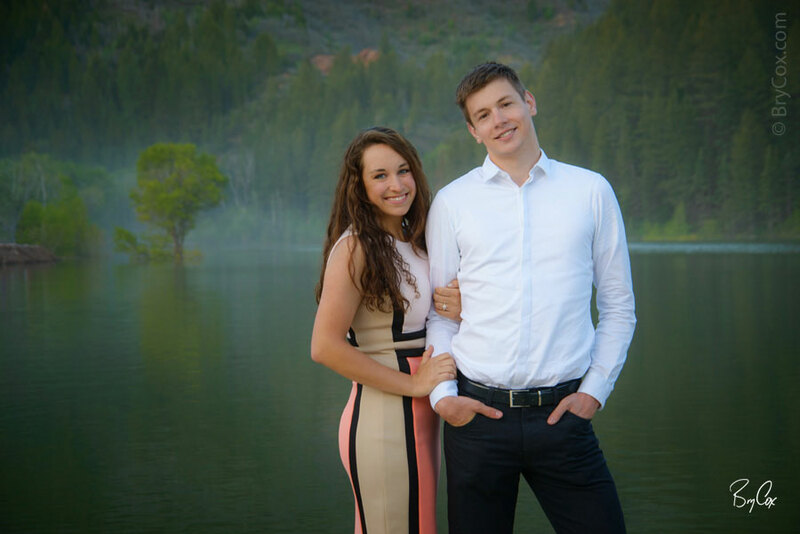 Let’s talk about creating some gorgeous photographs for you, 801-728-3317. 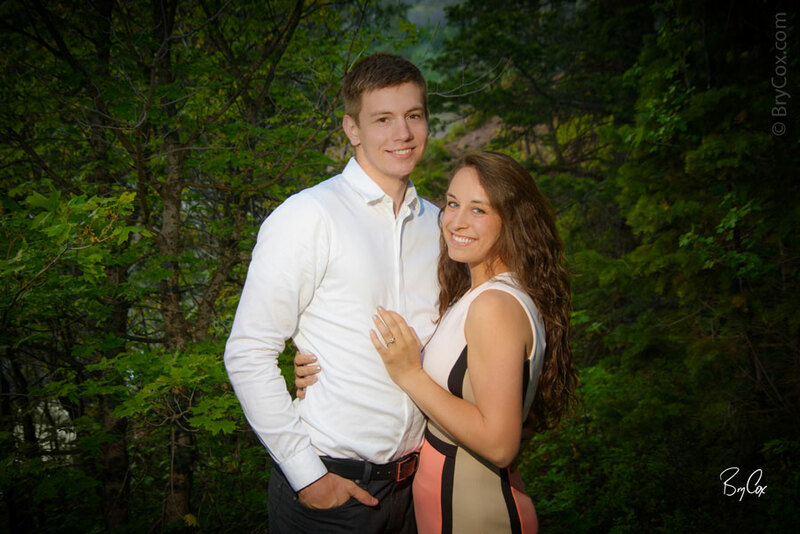 We can do engagements (like this shoot), bridals, the wedding day, or any combination. 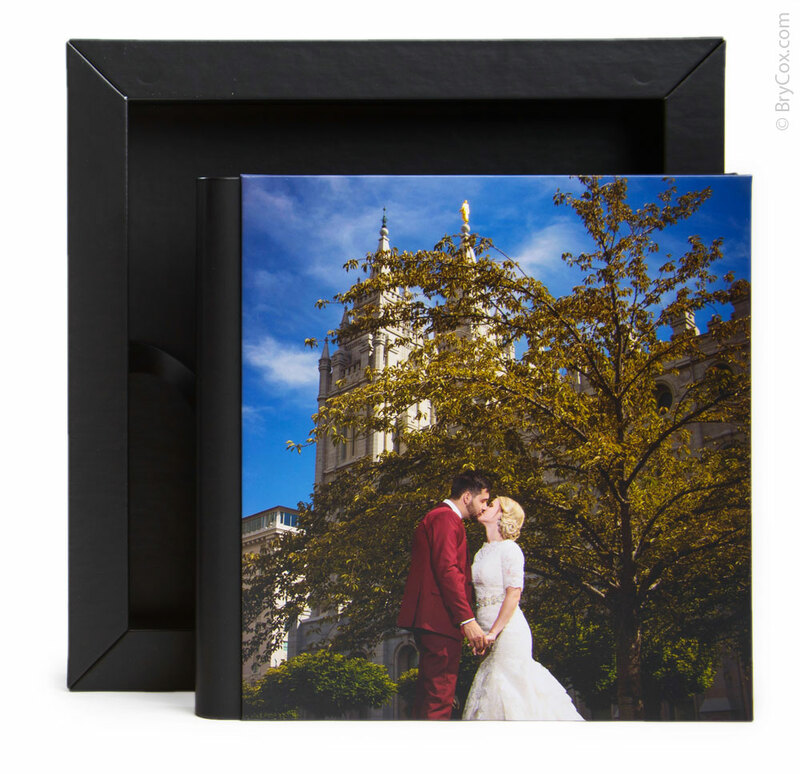 I’m excited to introduce a new line of wedding albums, and Nate and Kaylie are the first to receive it. Adding this to my other line, new clients will more options in terms of shooting time and price on their wedding day. And this book looks gorgeous and it’s beautiful to hold. Nate and Kaylie had such a beautiful wedding and they were such a photographic couple that I’ve been excited to share more of their images. You may have seen an early sneak peek of a few favorites in an earlier post, but here is their final album, each page shown in this video. Here is how the album looks, and the presentation box it comes in, including the clear magnetic cover. It makes for a great display when you’re not looking through the book, as well as giving you something to protect your album. 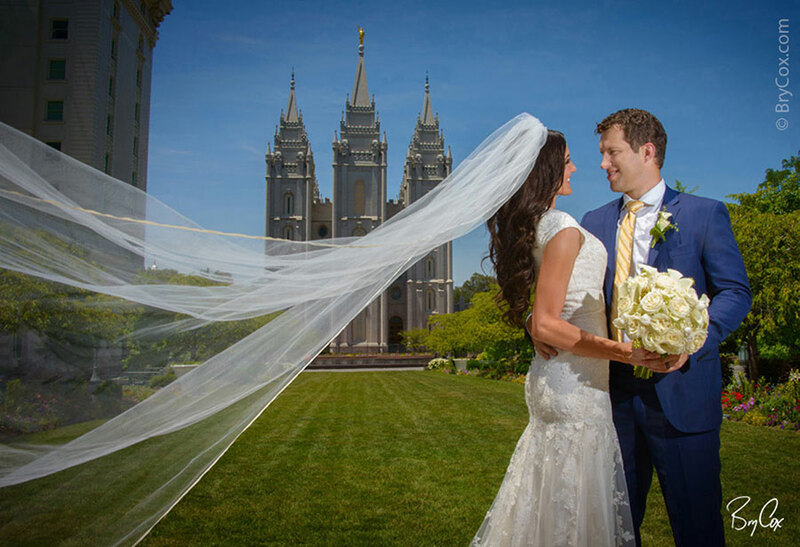 Nate and his wife also performed at their wedding. They’re both accomplished musicians with a group that tours all over the world. Their band rocked out at the reception, and I got this short video clip of Nate rapping. It’s worth seeing. If you’d like to talk more about wedding photography, give me a call. 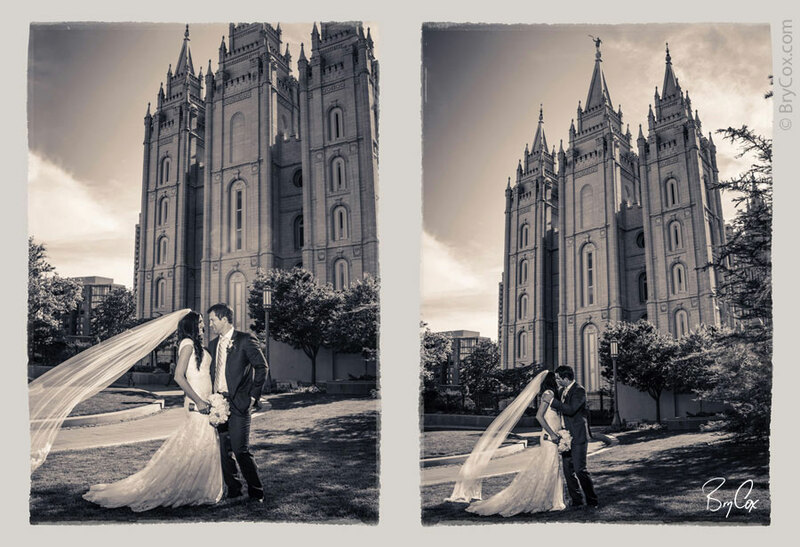 I love weddings and I’d love to create something amazing for you from your special day, 801-728-3317. And of course check out my main portfolio site with lots of samples and info too at BryCox.com.